So, we hear a lot from industry and our MP that there are SO many ‘checks and balances’ in the legislation that there is nothing at all to worry about. Is this true? Can we rely on those checks and balances? Lets unpack that. Checks and Balances. As a layperson, I would assume that it would be a bit like being ‘vetted’. That anyone wanting to mine would have their history looked at, be thoroughly checked to see how they operate as a company, how they have performed internationally (i.e. benefits brought, or breaches made), if they could pay for any accidents – don’t forget, there is a low likelihood of disaster in mining, but if one does happen, they are generally pretty darn bad! I would also assume that the ‘balances’ would be somthing like considering potential benefits (apparently there are economic benefits from mining, although we’d aregue those are really just for the company) against costs like species, habitat or aesthetic loss – a country like Aotearoa New Zealand that trades so much on it’s beauty surely needs to consider even the cosmetic costs of mining?! So, what are these ‘checks and balances’? 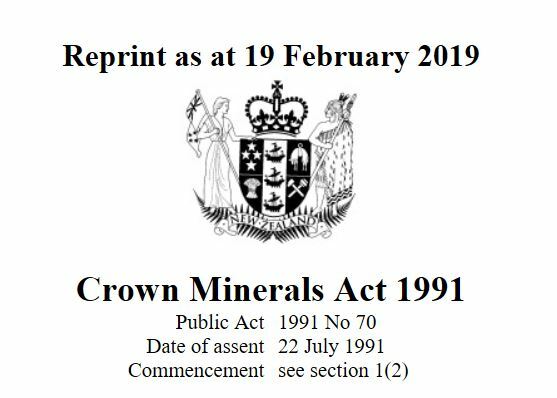 Mining in Aotearoa New Zealand is governed primarily by two Acts; the Crown Minerals Act 1993 and the Resource Management Act 1991. There are others that come into play – the Conservation Act, the Wildlife Act etc, but basically, the CMA and the RMA are the main ones. 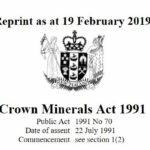 The Crown Minerals Act, as it stands at the moment, has, as it’s purpose ‘an Act to promote prospecting for, exploration for and mining of Crown owned minerals for the benefit of New Zealand’. This is unique in our legislation – no other Act of Parliament has a purpose to promote a single industry. What that means is that when making decisions about mining activities, both Central and Local Government must ‘give effect’ to that purpose; they must do what they can to promote mineral activity. Balanced? In this same Act, there are a range of provisions that could affect a decision to grant (or not) a permit – for example a clause asking the Minister to consider the applicants financial and technical ability, or their record of compliance both in New Zealand and internationally – when considering an application. So – the very first ‘check and balance’, the granting of a permit under the Crown Minerals Act – hows that working? Oceana Gold has been granted multiple exploration permits across the Hauraki Coromandel; the same company that has tried to sue the El Salvadorian Govt when it declined the company on the grounds of protecting their drinking water resources. The same company that has been accused of human rights violations in the Philippines. Another example – a company actively drilling our conservation estate is New Talisman Mining, a company with a very sketchy and unstable financial position, who clearly do not have the wherewithal to stump up the cash if the unthinkable happened. They wouldn’t be able to pay out to remedy environmental impacts or any other ‘unforseen’ impact. The other principal Act that we are asked to rely upon to ensure those checks and balances that will ensure that our environment and communities aren’t compromised, the Resource Management Act? Well, there are a range of mechanisms in there that might do that – but do they work? Well, if you ask any of the people who stood in hearing after hearing and asked the Courts not to allow mining underneath their homes they would say no! The Act goes some way to ensuring that this destructive industry cannot simply mine open slather, wherever they want, with whatever impacts (like in other countries they operate in); but it does not ensure that communities get the final say, it does not ensure that Councils are resourced on par with the often multinational mining companies and all the ‘experts’ that they can buy, it does not ensure that these same Councils are able to monitor the activities closely, that communities are adequately informed – that they understand both the short term effects and the longer term legacy or a myriad of other considerations and it does not ensure that the cumulative impacts of something like exlporatory drilling – fragmenting habitat etc – are prevented..
And we see the reality of this regularly – breaches of conditions, activities undertaken with no or incorrect permits, companies ‘getting caught’ discharging into our rivers and streams, clearing indigenous vegetation etc. 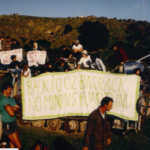 We see the changes that successive Governments make to this legislation – in 2013 many of the provisions that promoted and enabled public participation were removed, the very process by which a community can have any say in the various applications for mining in Aotearoa New Zealand. Many many people believe that the Hauraki Coromandel is protected – either because of our victories in the 1980’s, or because of Schedule 4 (the part of the CMA that ‘protects’ special areas of our public conservation land). Sadly, most of the Hauraki Coromandel actually remains vulnerable to mining – either on non conservation land or unfortunately, underneath all of it! Schedule 4 protects the Coromandel conservation estate only north of the Kopu Hikuai, and only above ground – there is nothing (except us!) to stop mining under it. We have been working damned hard to get that protection extended to include all of the Coromandel Range and are currently waiting on the Select Committee to report back, and the Minister to decide to honour the Governments pledge to do that, but that would still only protect public conservation land. The reality is, that the ‘Checks and Balances’ in the legislation are minimal, and weak at best. Given the destructive nature of this industry, and the secrecy that the Industry insists on, the legislation governing mining is woefully inadequate. The public’s (community’s) ability to participate is limited, by actual provisions in the Acts, and also by the resourcing of both themselves and Councils to respond to and evaluate the submissions and evidence that the mining companies provide. Much of the ‘expert’ evidence is difficult for Councils to evaluate as they often do not have access to their own experts in all fields, and for communities – even the language can be very hard to understand. The supposed checks and balances in the legislation that we are supposed to rely on to govern this destructive industry and its toxic legacy are simply not good enough. It is vital that we do not rely on these, but that we stay ever vigilant and that our communities continue to support us to change this – to get better legislation, to understand both the processes and what they mean and to ensure that this incredibly well resourced industry doesn’t undermine us and leave our landscapes industrialised, hollowed out toxic dumpsites. ← We won Open Cast, now they’re Trying to UnderMine Us!